Virtual call center companies offer a great opportunity for those looking for a work from home job. For other types of work from home jobs, feel free to visit the work from home companies page. Virtual call centers are call centers where the agents taking the calls do not work in an office together but instead all work remotely from home. Some well-known companies such as 1800Flowers, Uhaul, Nordstrom, and Disney offer virtual call center jobs from home but still obviously have office where they house other employees. This allows the company to save money in several different ways and allows those looking for a remote job to work for a well established company. Other companies such as Sitel, West at Home, and Working Solutions are actual virtual call center companies. These types of companies contract with other companies to run their virtual call center on their behalf. With some of these companies you may be taking calls for multiple clients or may not find out which client you will be assigned to until after you have been hired. Would a virtual call center job be a good fit for me? 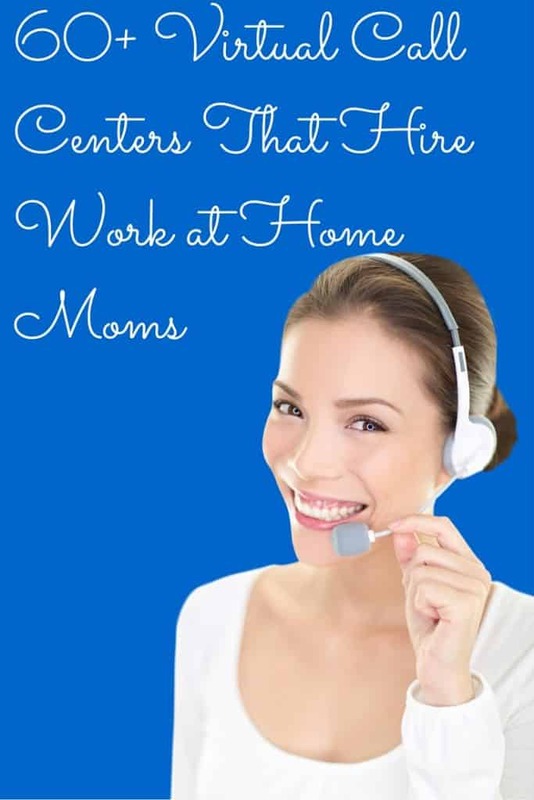 If you begin your work from home job search without much experience then finding a position at a virtual call center company is a great option. Most only require a high school degree and some kind of customer service experience. One big requirement most virtual call center companies have is a quiet work background. This is because most of these companies do not want the customers to know you are working from home. Moms with babies and toddlers at home may not be the best fit for these positions because of this unless you can work during a time they are sleeping or have someone to watch them in another part of the home during your shifts. What do I do as a virtual call center agent? The answer to this question varies by company. Most of these companies hire agents that take incoming customer service type calls helping customers place or check on their orders. Some of these companies are outgoing calls only and some do both. Most of the ones that do outgoing calls are more sales based and few of these are business to business sales. Before you apply with any of these companies decide what exactly you are comfortable doing as a call center agent and which ones would be a good fit for your specific situation. Interested in other virtual call center jobs? 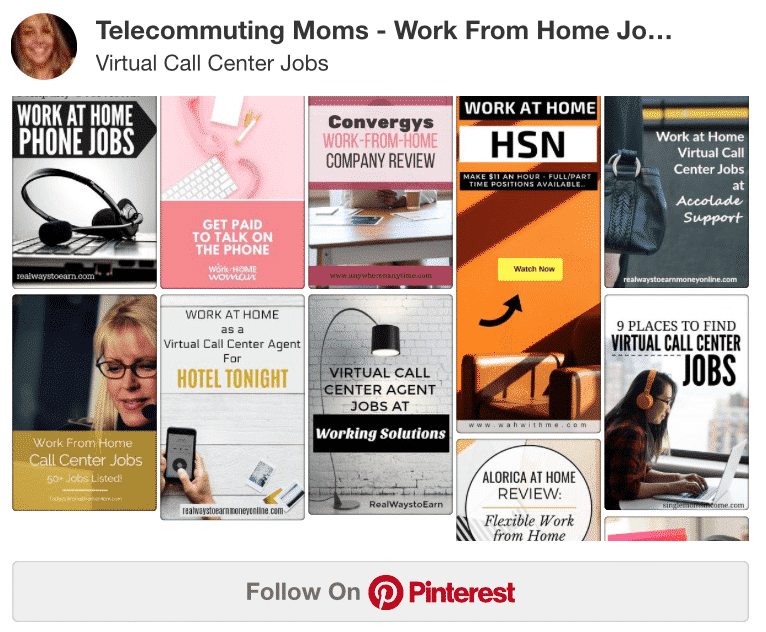 Follow out virtual call center jobs Pinterest board. How much do I get paid and what are my benefits? This also varies greatly from company to company. I would say most virtual call center jobs pay between $10-$12 an hour. Many of these companies bring agents on as independent contractors while others hire you as an employee. Being an independent contractor means a variety of things including the fact that you will have to figure out what that means for your taxes. It also means you have the freedom to work for more than one company if you wish but that there are no benefits included in the job. Some of these jobs are full time but most are not. I know many people who work for a few of them to get the number of hours they desire each week. Also, some of these companies pay by the hour regardless of how busy you are but some of them pay by the minute only when you are actually on a call. These are all factors you need to take into consideration when applying for one of these jobs.